If it is goalmouth action you want to see, best you get along to a Lutterworth Athletic game. Since the turn of the new year their six matches have produced an incredible 47 goals. 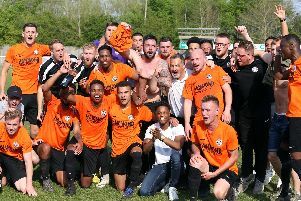 The latest extravaganza came at Irchester United last weekend when an injury-time winner from Sam Young saw them return home 5-4 winners. But while the entertainment level might be there, it is not necessarily the sight a manager wants to see. Lutterworth boss Mike English explained: “It is a concern – we’re conceding far too many goals at the moment. “Traditionally we’ve been a side mean at the back but not scoring many at the other end. It is completely the opposite at the moment. “Defences are notoriously fragile if they are not the same on a regular basis. “The challenge is getting consistency in selection – the same players out regularly. “This has probably been our worst season for fielding the same side consistently. “But you can use all the excuses in the book. We need to focus and concentrate for the full 90. English did reserve praise for the attitude his team showed and the way they reacted to adversity against Irchester. He added: “Irchester is a very difficult, challenging place to play. “When you are a goal down inside two minutes to a shocking penalty decision and two down inside 25 minutes, you start to fear the worst. “But we got ourselves back in the game before half-time and it swung completely. “And to win it with a volley from outside the area deep into stoppage-time was quite special.